There are many factors to consider when choosing an area rug for your home. Choosing the right material for your rug is one of the most important and basic considerations. The material used in the making of the rug will not only affect its appearance, but will also determine the ability of the rug to withstand use over a long period of time. No choice of material is simpler, or more natural, than wool. Natural wool is the material with the longest history of being used in the manufacture of rugs, and there is good reason why it is still being used today. Wool area rugs are beautiful, tough and durable. They are practical options for use any home where you want to add color and beauty to places which encounter a lot of foot traffic. Woolen rugs are available in many different sizes, shapes, colors and styles so it is easy to find one that will go with any existing or intended decorative theme or color scheme in your home. Many people appreciate the beauty and decorative value of world famous Persian carpets but few realize that these carpets are most often made of wool. While the more ornate Persian carpets often feature silk blended with the wool, simpler gabbeh rugs are made entirely of wool. The truly ornamental Persian rugs are made entirely of silk and too delicate to place on the floor. These works of art are usually hung from the walls. On the floor, the durability of wool is a definite asset. What’s more, they are comfortable to walk on; exude a luxurious feel and look; and are mildly fire-retardant, too. Being exceptionally beautiful and comfortable, they look good in both, traditional and modern-styled homes and add to an atmosphere of warmth and coziness in any home. To keep your wool rugs long-lasting, you should make sure to clean and maintain them on a regular basis. Woolen fibers attract dust particles, dirt, and dander very easily and other allergens. Moreover, wool rugs are not stain-resistant, and will thus require frequent cleaning, vacuuming and shampooing to keep them in good condition. However, the natural woolen fibers used in producing these rugs can withstand high temperatures. As a result, the rugs gain good fade-resistant qualities and retain their original colors for a longer time, without having to be replaced often … and that’s money saved in the long term. 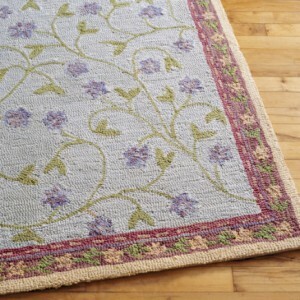 Wool area rugs are a simple way to beautify the floors of your home. Durable and soft, they will provide you comfort underfoot with minimal wear. Just remember to take care of them by cleaning them regularly and they will add beauty and comfort to your floors for years to come.